The Summer Season is still going strong in Big Bear Lake, but there are only a few weeks until Labor Day Weekend! Whether you plan on joining us this coming weekend, for a Labor Day Getaway or either of the spectacular weeks in between, Big Bear Lake has more activities, special events and things to do than anywhere else in Southern California! We have a Lake full of water activities, a National Forest with hundreds of miles of hiking/biking trails, Tours by Boat, 4×4, Helicopter, Segway, Kayak, or on foot, Live Concerts, Plays, Nightlife, The Village for shopping and dining, Fishing Tournaments, Old Miner’s Days, Film Festivals, Ropes Courses, Zipline, Art Shows, Wine Walks and SO MUCH MORE!! Big Bear Cycling Presents Big Bear Cycling Week from July 29th until August 7th. Schedule is listed below. Please visit website for more information. The Cave is a new, intimate music venue in Big Bear that promises to bring you up close and personal with its performers. Doors open at 6:30 pm Concert starts at 7:00 pm. Call or visit website for ticket information. Tour de Big Bear offers rides of 25, 50, 70 and 100 miles. For more information, including registration details, course maps and discounted lodging, or to register for the event, please visit website. The 15th annual Big Bear Valley Renaissance Faire takes place August 6-7, 13-14, 20-21 at Pederson’s Mill in Fawnskin. Our Faire is a continual day of mirth and merriment, excitement and education. The village streets lead you past crafts, costumes, food, stages, and games. The Enchanted Shire has six stages of ongoing shows performing every half-hour. There is also an arena for the jousts and the Great Square for pirate battles, maypole dances, and other fun! Music in the Mountains #4 with DSB at the Discovery Center will take place on Saturday August 6th. Adult ticket prices vary; $30 general admission and $40 premium seats for tribute shows and $40 general admission and $75 premium seats for national bands; ticket service fees will apply. Season passes for all 6 shows go on sale May 1, 2016, with the announcement of the September 3 finale show; $320 for premium seats and $185 for general admission inclusive of $25 discount each pass. ‘Pick 3’ passes will include a $10 discount and must be packaged as premium seats or general admission. Parking is sold separately and available on a first-come basis to all ticket buyers at $20 per vehicle. Handicap parking will be available at the Center at no charge on a limited and first-come basis with official license plate for placard. Free off-site parking at Meadows Edge, located ¼ mile west of the Discovery Center, will be available with free shuttle from 5pm to 10pm. Youth 12 and under admitted FREE. Teen (ages 13-18) tickets will be discounted $5. Both must be accompanied by a ticketed adult. All seating will be available on a first-come basis. General admission guests must bring their own beach chairs for the open and designated seating areas. Music-loving dogs on leash are welcome and admitted free. Parking and ticket gates open at 5:00pm; all concerts begin at 6:00pm. The Bear Valley Guild for the Arts and the Open Sky Music Foundation present Original Dean Martin Golddigger, Suzy Cadham in her award winning musical:“A Golddigger (not that kind!! )” at the Big Bear Lake Performing Arts Center. Suzy Cadham, one of Dean Martin’s Original TV Golddiggers, starring in her hit show, “A Golddigger (not that kind!! )”Direction by multi award winner, Ken Prescott , Musical Direction by Alex Danson featuring Jay Lewis on drums and Jeff Stover on bass. From the first downbeat, Suzy “WOWS” the crowd with her “Ethel Merman” delivery, and tugs at everyone’s heart strings, with her witty and poignant “Show Biz” tales and what it was like to be part of “The Golden Age of Variety TV”, on hit TV Shows, working with all the great stars, touring the country, and performing with Bob Hope on his USO Christmas Show, entertaining the troops in Vietnam, with a stop and dress rehearsal at The White House. Her rendition of familiar tunes, “My Heart Belongs To Daddy” or South Pacific’s“Honey Bun – There’s Nothin’ Like a Dame” or “Thanks For The Memories” will have you on your feet cheering, laughing, applauding and maybe even singing along! Suzy’s one woman musical journey, from the Great Plains of Manitoba to the bright lights of Hollywood, is pure entertainment, as she takes you on a nostalgic, musical journey. The show is accompanied with terrific pictures and video of Suzy performing alongside great stars like Dean Martin, Bob Hope, Johnny Carson, Tommy Tune,Paul Lynde, Lou Rawls. For more info. check out Suzy’s web pages at www.suzycadham.com or www.originalgolddiggers.com or her many performances on youtube. Guaranteed this will be the “MUST SEE” show of the season!!!! The 27th Annual Antique Car Club’s Fun Run takes place Friday August 12th through Sunday August 14th. The Fun Run features a car show with 500+ cars – roadsters, classics, antiques and hot rods, lining the streets of Big Bear Village. Friday is registration day from 9-5 pm for participants at the Bartlett Parking Lot, Saturday is the day to view the cars on display from 9-4 pm and the Fun Run drive around the Lake takes place at 3pm at the end of day on Saturday, and the awards ceremonies are on Sunday starting at 9:00 am. The Friends of the Big Bear Alpine Zoo invite you to their annual Ice Cream Safari on August 13, 2016. This yummy event will be at the Big Bear Alpine Zoo located at 43285 Goldmine Drive in Big Bear Lake. The event starts at 11 am and ends at 2:00 pm (or ‘til the ice cream runs out). There will be 5 ice cream stations located throughout the zoo, each offering a different flavor. Tickets for the Ice Cream Safari are $5 each for 5 scoops of ice cream. Enjoy a bowl of ice cream as you tour the zoo and learn about the zoo’s residents and why they are there. The $5.00 is in addition to the General Zoo Admission. Admission rates are: Adults $12.00; Children 3 to 10 years and seniors 60+ $6.00; under 3 years are Free. To learn more call 909-878-4200 or visit our website. The show features classic woodenboats, Chris-Craft models and other antique vessels. The event is sponsored by the Antique & Classic Boat Society, Souther California Chapter, and Nottingham’s Tavern. There is expected to be between 25 and 30 boats to start arriving on Thursday August 18. A Big Bear Lake Poker Run is scheduled for Friday August 20 for participants in the show.Boats will be on display at the Pine Knot Landing Docks from 9am to 4pm on Saturday. Admission is free, and most of the boat owners and skippers will be there to talk about the history of their boats. Classic Cars from the Big Bear Lake Antique Car Club will also be on display.The Antique Wooden Boat Show at Pine Knot Landing takes place on Saturday August 22nd with a jaw dropping display of antique and classic wooden boats. FREE to All. The Arts Council of Big Bear Valley presents its 18th Annual Fine Arts Festival: “Art on the Lake” which kicks off Friday evening with an opening night reception set to take place from 7 pm to 9 pm. Saturday hours are 10-7 pm and Sunday hours will be 10-4 pm and admission is FREE. 40+ artists from around the region will be exhibiting their work for sale as well as Live Music, Beer and Wine Garden and Food Vendors. The Arts Council strives to bring nothing but exceptional photographers, painters, jewelers, and sculptors to this annual event. Please call or visit website for more details. Music in the Mountains #5 with “The Long Run” Eagles Tribute at the Discovery Center will take place on Saturday September 3rd. The Long Run was formed in 1999 in Los Angeles by a group of well-rounded professional musicians with a love of harmony and a deep respect for one of the greatest rock bands of all time. After months of painstaking preparation rehearsing a long list of The Eagles’ chart-topping hits, The Long Run set out to win over audiences across the USA. The strategy was to provide authentic live performances. They quickly became regarded as the finest Eagles tribute band in the country by consistently delivering the lush harmonies and rich instrumental arrangements that made The Eagles an unforgettable part of rock history. The Long Run continues to successfully blend the classic Eagles sound into their own genuine live performance style, delighting audiences young and old with faithful recreations of some of the best music ever written. The Inaugural Big Bear Kids Adventure Games features a kid-sized adventure race where teams of two navigate a natural terrain inspired obstacle course. This event allows kids ages 6 through 14 an opportunity to experience the thrill of adventure racing, while learning teamwork skills and building confidence in a one-of-a-kind outdoor experience, created just for them. Kids can expect mountain biking, hiking, ziplines, a Tarzan rope swing, giant Slip-n-Slide, river tubing, cargo nets, mud pits and more. A great day out for the whole family! All kids will receive a certificate of completion upon finishing the race during the after race celebration and awards ceremony. Awards will be given to top teams in each age category, as well as special awards for sportsmanship, spirit and environmental consciousness. The party will conclude with a prize raffle for all participants. *Time subject to change, awards will occur within 20 minutes of the last team crossing the finish line. Art on the Corner : A New Art Show in the Heart of Big Bear Village on the corner of Village Drive and Pine Knot Avenue. Fine Art and Craftsmanship will be features in a variety of mediums. Enjoy a glass of wine, enjoy the music and browse the wonderful artwork. Proceeds to benefit the Bear Valley Guild for the Arts. FREE for all to attend. Opening Night Reception on Friday September 2nd from 7-9 pm. Please call for more information. Contact – Gail McCarthy – 909-585-2868. Quilts for Sale – Boutique – Vendors – Boutique – Door Prizes and More! Location: Big Bear Middle School at 41275 Big Bear Blvd. The Big Bear parade is the longest running community event in the Valley and has brought residents and visitors together to celebrate the heritage of the Big Bear Valley and honor members of our community and the Nation’s military. Once again this year, Old Miners and the Village Business Association bring this traditional event to the Village, the Heart of Big Bear. In the meantime please call or visit website. The Big Bear Lake Oktoberfest celebrates 46 years of German style family fun and good times this year. Rated Southern California’s #1 Oktoberfest, this Fall’s festival offers authentic German entertainment, food and beer! The Big Bear Lake Oktoberfest runs for eight consecutive weekends, September 10 through October 29 at the Big Bear Lake Convention Center, located at 42900 Big Bear Boulevard in Big Bear Lake. The times are Saturdays 12 noon to 12 midnight and Sundays 12 noon to 5:30 p.m.
More information to be announced later in the year. In the meantime, please call or visit website for more details. Trail running in the San Bernardino Mountains at it’s finest will be on display for the Kodiak 100 miler, the Kodiak 50 miler and Kodiak 50K. Southern California mountains tend to surprise people, especially in September-its phenomenal conditions. It’s typically sunny, the temperature is almost always comfortable, considering this course is ALL between 5,100′ and 10,000′ . The nights can be that nice cool Alpine chill, but no where near freezing. (if you’re a shirtless runner, you may want to reconsider at least for this night section. Day times- late September, should be stellar- with temps in the 60′s and 70′s. It’s pretty reliable and trusty weather in Late September, high likely hood of great race conditions. BIG Change for 2016 – Reversing Course! In an effort to keep things interesting we will be reversing course and running clockwise around the lake! Did that just put the summit of Sugarloaf at mile 75? Why yes, yes it did. Some will ask, why would you do that? It takes out the Siberia Creek climb which is the highlight of the course. And they would have a point. However, the reverse direction presents it’s own set of unique characteristics and challenges. The run from Grandview to the bottom of Siberia Creek is absolutely gorgeous, the climbs in this direction are STEEP, Sugarloaf Mountain and the technical terrain leading to and from it will be a MAJOR factor late in the run. Regardless of direction this course is tough and beautiful! Finish Festival and Awards at the Village & Pine Knot in The Village of Big Bear Lake. The Big Bear Fine Arts Festival is set to take place on September 24 and 25 in the Village of Big Bear Lake. Come join us for a Big Bear Autumn Celebration that weekend with the Fine Arts Festival, The Village Fall Wine Walk and Big Bear Lake Oktoberfest. Something for Everybody! Fine Arts Festival is FREE to the public. The Summer Season is underway in Big Bear Lake and Independence Day Weekend is coming fast! 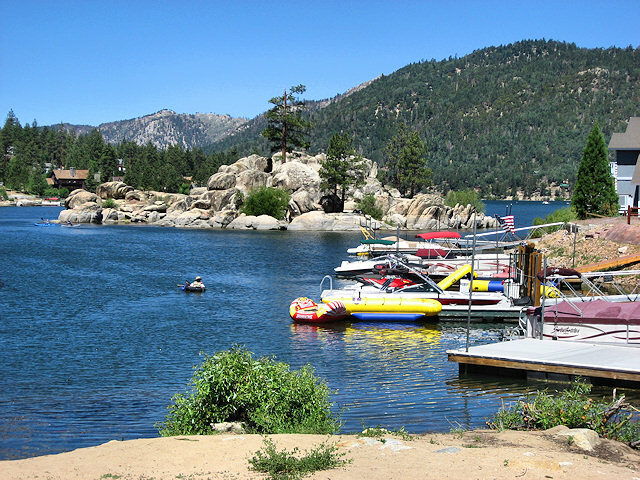 Whether you plan on joining us this coming weekend, for a July 4th Getaway or any of the spectacular weeks of summer, Big Bear Lake has more activities, special events and things to do than anywhere else in Southern California! We have a Lake full of water activities, a National Forest with hundreds of miles of hiking/biking trails including a state of the art Downhill Bike Park, Tours by Boat, 4×4, Helicopter, Segway, Kayak, or on foot, Live Concerts, Plays, Nightlife, The Village for shopping and dining, Fishing Tournaments, Old Miner’s Days, Film Festivals, Ropes Courses, Zipline, Art Shows, Wine Walks, Bike Races, Car Shows, Fireworks, and SO MUCH MORE!! In 1974 six Corvette fanatics got together and started a club for Corvette owners in the Inland Empire. Corvettes West is still based out of the Inland Empire in So Cal, we currently have over 100 members. Corvettes West hosts the largest ALL Corvette event in the Western United States, Big Bear Bash. This year, 2016 will be our 34th anniversary of this event. It is also the oldest ALL Corvette event in the Country still being host by a Corvette Club. Corvettes West’s Big Bear Bash 2016 takes place this year from June 24th until June26th. Lots of great Vettes’ to check out and admission to public events is FREE to all. Main event for public viewing of cars is the Participants Choice Car Show at the Parking Lot of Robin Hood Resort on Friday June 24th from 2:00 pm to 4:00 pm. Other events include a Low Speed Autocross at the Big Bear Airport on Saturday June 28th at 8:30 am and a Corvette Caravan Around the Lake on Sunday morning. CATS, The Community Arts Theater Society will present the delightful Broadway musical“TAKE ME ALONG” for 11 performances at the Big Bear Lake Performing Arts Center.Performances are June 24, 25, 29, July 1, 2, 6, 8 & 9 at 7:30 and Sunday matinees on June 26,July 3 & 10 at 1:30. All performances are reserved seating and prices range from $17 to $29 for Adults, $16 to $27 for Seniors and $11 to $20 for Students/Children depending on date and location of seats. For info and tickets check CATS web site at http://www.bigbeartheater.org or the PAC Box Office at 909-866-4970. Based on Eugene O’Neill’s classic comedy, “Ah, Wilderness!” the Broadway musical, “TAKEME ALONG” is set on July 4, 1906. Originally starring Jackie Gleason, who won a Tony Awardfor his hilarious performance, and also starring Walter Pigeon in his magnificent singing role,“TAKE ME ALONG” is a high spirited family musical filled with wonderful songs anddelightfully funny scenes. Teenage children as well as Senior citizens fall in love, come of ageand try to stay out of trouble. If you liked “The Music Man”, you’ll love “TAKE ME ALONG”. DJ Night at the Cave. FREE admission to all over 18 years old. Food and Drink Specials. The Cave is a new, intimate music venue in Big Bear that promises to bring you up close and personal with its performers. Doors open at 6:30 pm Concert starts at 7:30 pm. Call or visit website for ticket information. Music in the Mountains #1 with Taylor Dayne and Sophie B. Hawkins at the Discovery Center will take place on Saturday June 25th. Season passes (bench seats), premium tickets (bench seats), general admission tickets and parking are available for purchase online and walk up. A ‘Pick 3’ events package and discounted tickets for local full-time residents; active and retired military; first responders, fire and police; and Mountains Foundation volunteers are now available with proof on a walk-up basis at The Cave Box Office; open Wednesday through Sunday. Check ticket web sites for hours of operation. A 20% discount will apply only to general admission tickets; no online purchase option available. Youth 12 and under admitted FREE. Teen (ages 13-18) tickets will be discounted $5. Both must be accompanied by a ticketed adult. All seating will be available on a first-come basis. General admission guests must bring their own beach chairs for the open and designated seating areas. Music-loving dogs on leash are welcome and admitted free. Art on the Corner in the Heart of Big Bear Village on the corner of Village Drive and Pine Knot Avenue. Fine Art and Craftsmanship will be features in a variety of mediums. Enjoy a glass of beer or wine, enjoy the music and browse the wonderful artwork. Proceeds to benefit the Bear Valley Guild for the Arts. FREE for all to attend. Hours are 10:00 a.m. – 6:00 p.m. Saturday, Sunday and Monday July 2-4. Opening Night Reception on Friday July 1st from 7-9 pm. The 30th Annual Big Bear Lake Independence Day Festival and Craft Show with Unique One-of-a-Kind Items, Family Fun Activities, Live Entertainment, Patio Dining, and Wyatt’s serving Full Menu & Full Service Bar. For more info please visit website or call. The Big Bear Summer Artwalk takes place July 2-4 in the heart of the Big Bear Village. Each year in July since 2004, the Artwalk Festival showcases exhibits by regional and local artists selling their works in Oils, Acrylics, Mixed Media, Photography, Ceramics, Glass, Wood, Metal and Jewelry. The City of Big Bear Lake has invested nearly 5 Million Dollars over the past couple of years in new sidewalks, landscape and lighting improvements for the Village Shopping, Dining & Entertainment District. Make plans to experience the Artwalk Festival, meet the Artists and enjoy the day supporting the Arts in Beautiful Big Bear Lake, So Cal’s Leisure Travel and Getaway Destination! Doors open at 6:30 pm Concert starts at 8:30 pm. Call or visit website for ticket information. Live Reggae music, bring your picnic and BBQs or buy your picnic from Tropical BBQ (Hawaiian BBQ). Huge beach so bring your chairs, beach blankets and umbrellas to get your spot early. View the Big Bear Lake Rotary fireworks from Captain John’s. Rentals start at 7 a.m. Admission is FREE with Parking fee. Please call or visit website for more info. The Annual Rotary Club Big Bear Lake Fourth of July Lakefront Fireworks and Barbecue at the Marina Resort on Big Bear Blvd. Reserved Seating and Meals with Live Entertainment and Kids Games before the Fireworks Start. Fireworks begin between 8:45-9:15pm. For more information please call the Big Bear Visitors Bureau at (800) 424-4232. View the Fourth of July Fireworks Spectacular aboard Miss Liberty Paddlewheel Tour Boat. We offer the best seats on the lake! Join us once again for Lakefront Fireworks! Tickets are $100 per person. Dock departure at 8 pm and tour returns to dock upon completion of fireworks. Enjoy light snacks, music, fun give-a-ways, and beer, wine and champagne in our Galley. Come attend the biggest 4th of July fireworks display in Southern California. The fireworks are shot off from a barge on the Lake directly off of Pine Knot Landing. Fireworks begin between 8:45-9:15pm. Viewable from any of our public parks or the best spot, from a boat on the Lake. Make sure to bring a jacket or blanket because it can get cold. Snow Summit and Big Bear Lake Brewing Company present the 2nd Annual Crafts & Cranks Bike Race Weekend and Craft Brew Fest on July 9th. Finalists from previous Summit Downhill Series and Team Big Bear races will compete in multiple events for a $25,000 prize purse. Spend the day racing and spectating while enjoying California’s premier Micro brews and Bands; featuring Live Music by Project N-Fidelikah, Tomorrow’s Bad Seeds, Demrick, and Main Man. Enjoy tastings from 40 of California’s Premier Breweries, learn about new products from the industry’s top exhibitors, and take part in games and activities for the whole family. Visit www.bigbearmountainresorts.com or call 844-GO2-BEAR for more information. Brody Dolyniuk is a multi-faceted, self-taught musician who began his professional music career playing in piano bars. A chance meeting with a pair of star-shaped sunglasses led to forming an Elton John tribute band Brody called Yellow Brick Road. Soon YBR began going outside the EJ catalog to perform other classic rock giants such as Led Zeppelin, Pink Floyd and more.Within a year, YBR was a steady working band in the Las Vegas music scene and had cultivated a large local following. YBR also became an in-demand choice for the corporate entertainment market. Ready to get your paddle on? The 9th annual Big Bear PaddleFest is held on Big Bear Lake, hosted by North Shore Trading Company. 5K Recreational Race, 10K Elite Race, 20K Around the Lake Challenge, Sprints and Relay Races. Music, Sports and Boating Expo and much more. Location to be announced in early 2016. Big Bear Airport Young Eagles Program KIDS FLY FREE! The Young Eagles program is held at the Airport and flys on the second Saturday of each month from 9:00 a.m. to noon, May through September. This is a wonderful experience for young flyers. The Young Eagles program was started by the Experimental Aircraft Association (EAA) in an effort to stimulate interest in aviation for young people. Children between the ages of 8 and 17 are offered a free airplane ride around the Big Bear area by pilots from the Pilot’s Association. Pilots must be a member of the Pilot’s Association and the EAA in order to participate in this program. We have run this program for five years and have flown thousands of children. Each child will be given a preflight review of the basics of flight and the main parts of an airplane prior to the flight. No appointments are necessary, but each child must be accompanied by a parent or adult who must sign a release of liability for the child and can then take pictures of the happy flyer after their flight. Due to inclement weather at times in Big Bear, Young Eagles flights may be cancelled at short notice. For further information on this program call Roger Schmidt at (909)547-0832. For additional background information and activity suggestions log on to the Young Eagles web site at www.youngeagles.org. The 75th annual Big Bear Women’s Club Flower Show at The Performing Arts Center. Judging is on Friday from 10:15 AM to Noon. Open to the public Noon to 5:00 PM on Friday and 9:00 AM – 2:00 PM on Saturday. Admission is FREE. For More info please call (909) 866-6777. The 14th annual Xeriscape Garden Tour sponsored by the Sierra Club Big Bear group is set to take place on Saturday, July 16th. Participants can begin the FREE self-guided tour anytime between 9 am and noon starting at Eminger’s Mountain Nursery, located at 41223 Big Bear Blvd. in Big Bear Lake, across the street from the Denny’s Restaurant. Once registered, participants will have until 4:00 pm to complete the driving tour of the homes in Big Bear Valley. A tour booklet, which includes the locations of the 8 stops, a map and helpful information on gardening in the mountains, will be handed out at the starting location. The Xeriscape Garden tour, put on by the Sierra Club Big Bear Group, is the perfect opportunity to get landscaping ideas, discover drought tolerant plants and learn how to save money on your water bill, all while creating a beautiful garden. This year’s theme focuses on education and identifying drought-tolerant and native plants with “What’s that Plant.” Volunteers at each of the featured gardens will have a plant list specific to that particular home, identifying the top ten plants to help you find the plants you would like for your garden. Plant names and a brief description will help attendees make their own plant lists with the confidence of knowing they are planting beautiful drought-tolerant plants. The plant lists will also be highlighted on the Xeriscape Website at http://bigbeargardentour.weebly.com. The X-Tour Photo Contest will also be back this year with three categories: Plant/Flower Close-ups, People & Gardens, and Overall Garden. The top winner in each category will receive a $20 nursery gift card. More details on how to enter will be included in the tour booklet. The tour will once again highlight the DWP’s Xeriscape Demonstration Garden on Fox Farm Road, in front of the Community Garden, with native plant expert Orchid Black on hand to answer questions. In addition to the Demonstration Garden, there will be 6 homeowner gardens, landscaped by professionals and homeowners. So no matter your budget, you’ll find solutions for creating low-maintenance, drought tolerant gardens here in Big Bear. For additional information on the Sierra Club’s Xeriscape Garden Tour contact Lisa Patterson at 909-866-1067. To see pictures of previous tours, go online to: http://bigbeargardentour.weebly.com. The Old Miners Association presents the Big Bear Chili Cook­off. Sanctioned by the International Chili Society, festivities include more than 100 chili cooks, vendors, outhouse races, and a children’s game area. Come see our Wild West Shows, Live Music and plenty of Chili. Admission to the event is free, compliments of the Old Miners Association. Tasting Kits will be available for purchase. The purpose of the Old Miners’ Association is to produce special events of a historical and entertainment nature for residents and visitors that promote a spirit of cooperation and unity throughout the Big Bear Valley. Such events celebrate the rich historical and cultural heritage of the San Bernardino Mountains. Much like the gold fever that once spread through these mountains over a century ago, “Outhouse Race Fever” has clearly struck Big Bear. Come to the Calcutta Auction and bid on the fastest “People-Powered-Potty in the West.” The winning bidder splits the prize pot with the championship teamand Old Miners. The championship team is awarded the coveted “Golden Outhouse” trophy as wellas gift certificates from Old Miners event sponsors. A “People’s Choice” award will also be grantedto the best decorated outhouse and team costumes. Race-ready outhouses will be available for rent– reserve in advance to ensure a place in the bracket! Location: Bartlett Events Area in The Village of Big Bear Lake at 630 Bartlett Rd. On Sunday, June 17, the day following the Xeriscape Garden Tour, the second Eco-Sunday Adventure Festival of 2016 will take place at the Big Bear Discovery Center. Old Miners and the Big Bear Moose Lodge #2085 present one of Big Bear’s wackiest traditions: the Fawnskin Doo Dah Parade. Although rumored to be the World’s Shortest Parade, it sure isn’t short on fun. After the parade, enjoy great food, live music, crafts and children’s games in partnership with the Fawnskin Moose Festival. Come witness an old tradition honored in a creative new way as Old Miners presents the 2nd Annual“Ride n’ Tie” Mountain Bike Race on July 18th. In earlier days gone by, two-person teams would race a burro from Pioneer Town to the trails of Holcomb Valley during Old Miners Days. Now,teams of two will race a single bike in a 10-mile loop beginning and ending in the beautiful mountain community of Fawnskin. The bike must be swapped at least twice and both team members must finish together. Another Old Miners Days tradition returns with some new twists on July 18th in the historic town of Fawnskin. Participants will compete in numerous contests including the Tomahawk Throw, BiscuitCut, Jack & Jill cross, competition gold panning and ore mucking. Events include both single and team contest categories. Cost: Free for Spectators, $5 – $10 per person per contest, Applications can be completed at event. 21st Annual Run For The Grizzlies! The Friends of the Big Bear Alpine Zoo (FOBBAZ) invite motorcycle enthusiasts and the general public to the 21st Annual Run for the Grizzlies, a Motorcycle Poker Run and Festival. Event proceeds will help pay for the grizzly bear families’ new habitat at their modern home in the new Big Bear Alpine Zoo. The event is open to the public and all motorcycles are welcome. The Village event will feature live music by local band, “Damn Good Question,” raffle prizes, and a silent auction. The Motorcycle Chapter Challenge Award will be presented to the motorcycle club/chapter with the most members present. In addition, vendors selling motorcycle items, clothing and jewelry will display their wares. Chad’s Place is sponsoring the live music and will offer food, beer and cocktails at the event. Thirty vendor spaces are available for businesses and individuals to promote their products and services. Event sponsorships and program advertising is also available and donated items and services for the raffle and silent auction are very much appreciated. The 7-Stop Poker Run will take bikers around Big Bear Lake and include stops at the Big Bear Alpine Zoo, Chad’s Place, Get The Burger, Big Bear Mountain Brewery, the Fawnskin Moose Lodge, BJ’s Sandwich Shop, and the final stop at the event itself. An early bird discount fee is available online only at http://www.runforthegrizzlies.com through July 1. After July 1, the registration fee increases both online and on-site on July 23. Event registration includes a Run for the Grizzlies t-shirt, the Run Pin and the printed program. FOBBAZ was formed in 1989 as a non-profit public benefit corporation whose purpose is to support the Big Bear Alpine Zoo through: educating the public regarding treatment, protection, and conservation of wildlife; recruiting and coordinating zoo volunteers; and fundraising. Contact Event Planner Ellen Clarke at runforgrizzlies@fobbaz.org for more information. If you have questions about registration, please contact Gale Nichols at FOBBAZ at (909) 878-4200. The fourth annual Spirits of the West Brewsfest will celebrate the National Day Of The Cowboy on Saturday, July 23, 201. This year’s beer and spirit tasting will again include a full day of Western fun for the entire family featuring action shooters; games of skill, arts & craft vendors, live music throughout the day. With more than 40 different beers and 20+ spirits to sample, the Brewsfest has become the mountain’s largest sampling event. This year’s beneficiaries will be the Bear Valley Marine Corps League Detachment 1038, as well as the National Day of The Cowboy Non Profit. Spirits of the West is an action-packed outing for the entire family. In addition to beer and spirit sampling, the day’s activities feature the Temecula Gunfighters performing four shows throughout the afternoon and evening. Little visitors will enjoy carnival games, bounce house, face painting and horseshoe painting. A variety of arts, crafts and collectibles vendors will be on-hand selling their wares. Wyatt’s Cafe & Saloon will also be open serving up the mountain’s heartiest ranch-style food. Live entertainment takes place throughout on two outdoor stages featuring the Shadow Mountain Band on the main stage and the Silver Moon duo on the Fairway Stage. The evening’s entertainment features DJ Joe Vonesh spinning a huge variety of country. Spirit and beer sampling includes everything from flavored organic beers to IPA’s. Bourbons, whiskeys and tequila will also be available for sampling. Sample tickets are $1.00 each for beer and $3.00 for spirits. The under 21 crowd will enjoy sampling a variety of sodas. Gates open at 1:00 p.m. with sampling through 7:00 p.m. Both daytime and evening festivities offer Free Admission for the entire family. For complete event details please call or visit website. Music in the Mountains #3 with John Waite at the Discovery Center will take place on Saturday July 23rd. Season passes (bench seats), premium tickets (bench seats), general admission tickets and parking are available for purchase online and walk up. A ‘Pick 3’ events package and discounted tickets for local full-time residents; active and retired military; first responders, fire and police; and Mountains Foundation volunteers are now available with proof on a walk-up basis at The Cave Box Office; open Wednesday through Sunday. Check ticket web sites for hours of operation. A 20% discount will apply only to general admission tickets; no online purchase option available. The Tubes successfully combine rock, theatre and satire. Their biting combination of offbeat subject matter, complex yet muscular arrangements, and provocative presentation pushed the boundaries of rock like few before or since. Most modern visually-oriented acts owe a debt—knowingly or not—to the Tubes. Bear Valley Bikes and Open Air Big Bear present the 3rd annual Big Bear Mountain Bike Gran Fondo and Grizzly 100 in Big Bear Lake California. The Big Bear MTB Gran Fondo joins the ranks of premier Southern California endurance mountain bike events with rides for all levels. Riders challenge their personal abilities with distances of 20/30/70/100k. The 20k allows intermediate riders to take the Snow Summit Sky Chair to the ridgeline to begin their ride, while other rides begin in the Village and may include 3,500 to as much as 10,000 feet of climbing. Sinbad is an American stand-up comedian and actor. He became well known in the 1990s from being featured on his own HBO specials, appearing on several television series, and starring in the films Necessary Roughness, Houseguest, First Kid, Jingle All the Way and Good Burger.. Looking for a way to BEAT the HEAT? Escape to beautiful Big Bear Lake for a quick getaway. Our daytime highs this coming week are expected to be in the mid 70’s with clear skies! Absolutely GORGEOUS! 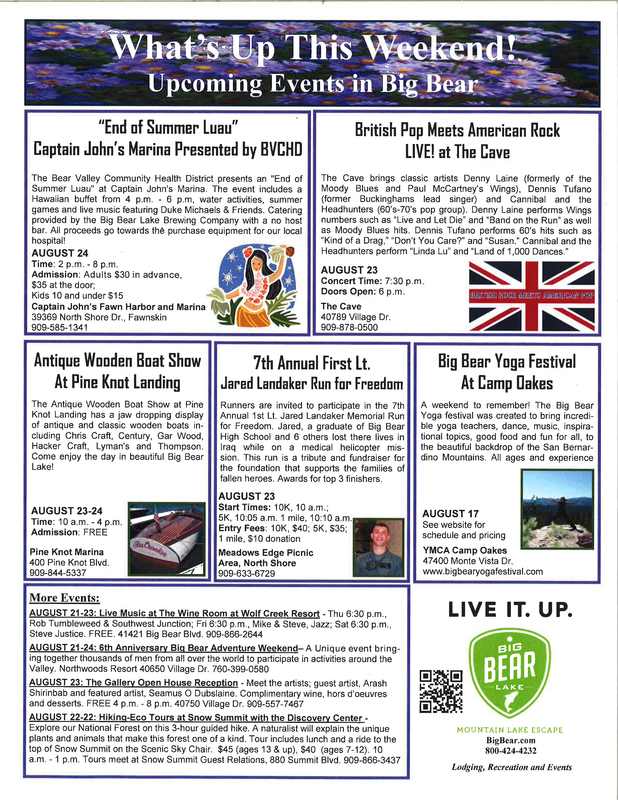 This weekend in Big Bear, you can find your zen at the Yoga Festival, rock out to some live music in The Village, check out the beautiful boats at the Antique Wooden Boat Show, or run for a great cause in the 7th Annual Jared Landaker Memorial Run for Freedom. These events, along with activities for the whole family are just a couple of hours away in the San Bernardino Mountains. Summer is winding down, but you still have time to enjoy all that Big Bear has to offer its summertime visitors. Labor Day Weekend is only a week away and if you haven’t found a cabin yet, you are in luck! RS Vacations has cabins of all sizes still available and we are currently offering 50% off your third night for Labor Day stays on all of our available cabins. Why not make an end of summer trip with family and friends before school schedules and holiday planning begin? Visit RSVacations.net and book your Big Bear Cabin for Labor Day today! !